As Disco Dodgeball nears launch, I’ll be adding Steam trading cards to the game and to make things interesting I’ve reached out to a wide variety of fantastic artists from around the world and will have them each create a trading card in their own personal style and interpretation. In the works are things like a pixel art de-make, a Dyscourse crossover, and an illustration of the ‘Early Years’ of the dodgeball robots. Loading Screen Podcast with Owlchemy Labs! Saam Pahlavan of The Loading Screen Podcast interviewed Alex about Owlchemy Labs, chopping wood, Kickstarter, and Dyscourse! It’s nearly Thanksgiving and we have a lot to be thankful for here at Little Worlds Interactive. We’re thankful that the iOS launch of The Counting Kingdom has gone wonderfully, and we’re thankful for our amazing and supportive community. We’re especially thankful for the teachers who work incredibly hard every day to help students be the best math wizards they can be! 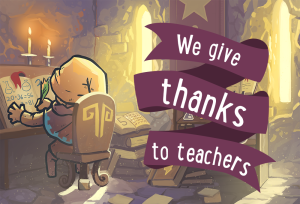 To show our thanks to teachers we’d like to give back: between now and Friday Dec. 5th we’re giving away 5 free copies of The Counting Kingdom (on PC/Mac) to every teacher who emails us! 1) Email us at hello@littleworldsinteractive.com with the subject line “Thankful for Teachers Giveaway”. Please make sure you email us from your school account. 2) Verify that you are a teacher in your email. You could link to your school’s faculty directory or email us a scan of your faculty ID card. Thank you to all of the amazing teachers out there, we hope you have a wonderful Thanksgiving! It’s been only a few weeks since The Counting Kingdom launched on the App Store and the response has been amazing! The game has been featured by Apple in the Educational and Kids categories, and is listed as a “Best New App”. It has also earned a 5-star ranking from players, with over a dozen reviews from happy parents and teachers. Please don’t forget to rate and review the game on the App Store – the monsters would be so grateful! Don’t have The Counting Kingdom yet? This award-winning game would make a great present for any kid, parent or teacher! Disco Dodgeball just hit 3 million views on YouTube! 90% of those views can be attributed to the top 10 videos, many of which are made by people with millions of subscribers. But the game is also popular with a ton of smaller channels – there are hundreds of individual videos and it’s awesome to see that people are excited enough about the game that they want to share. In order to make this happen, I just started by sending over keys to some smaller channels. They’re generally very receptive to playing new games, and a lot of YouTubers watch other channels to see what kind of content is popular so it basically just spread to larger channels from there. I was also able to get a few very large videos simply by sending an email to the channel’s business address. Fortunately it’s the kind of game that is easy to get into, is visually exciting, and also great fodder for doing cross-channel collaborations, so that’s probably a good part of the reason it’s gotten good traction with that community. Getting a job and the the impotence of attenuation to detail. I recently gave a talk to an awesome group of students at SNHU about getting a job in the industry. Today’s the day! We are so proud to announce that The Counting Kingdom has launched for iPad & iPhone. Grab your copy today to start using math and magic to defend the kingdom! Jack Lumber and Snuggle Truck now have Steam Trading Cards! Both Jack Lumber and Snuggle Truck now have Steam Trading Cards, Badges, and Emotes! For those of you who are into that kinda thing, you should check em out! To celebrate, both games are 50% off this week! Check out Jack Lumber and Snuggle Truck on Steam today! To close out October I decided to have a week-long Disco Dodgeball charity battle royale to raise some money for Doctors Without Borders, who are currently heavily involved in the fight against Ebola in West Africa. The game was put on sale for half off for the event. During the week I encouraged streamers to battle other channels in grudge matches, and at the end all of the proceeds were donated. I was able to raise $480, and hope to do similar charity events in the future. Elegy will really succeed. It’s lovely to write your own short tale. Thanks Rock, Paper, Shotgun! Dejobaan and Popcannibal think so too. But it’s nice to hear someone else say it.